Why does Dracula look like someone’s random drunk uncle? For once, the European cover says it all. Ghost House really is chock full of bats. 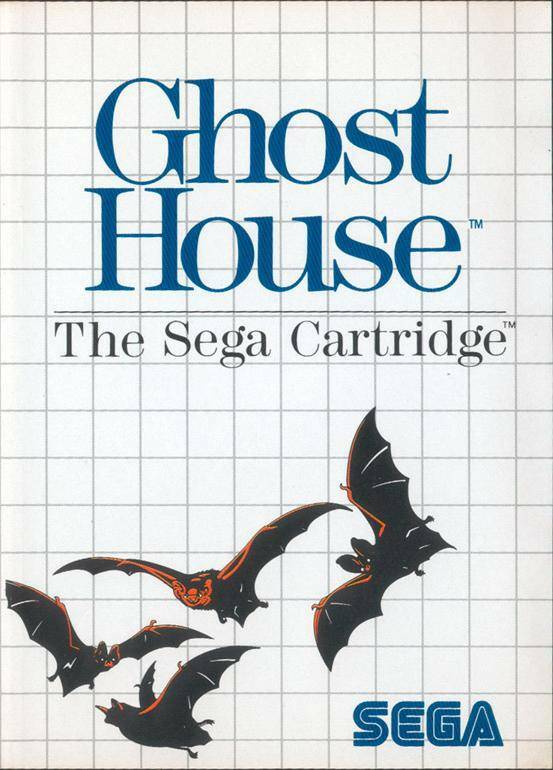 The aforementioned is, more or less, the premise of Ghost House, a ridiculous Master System original. 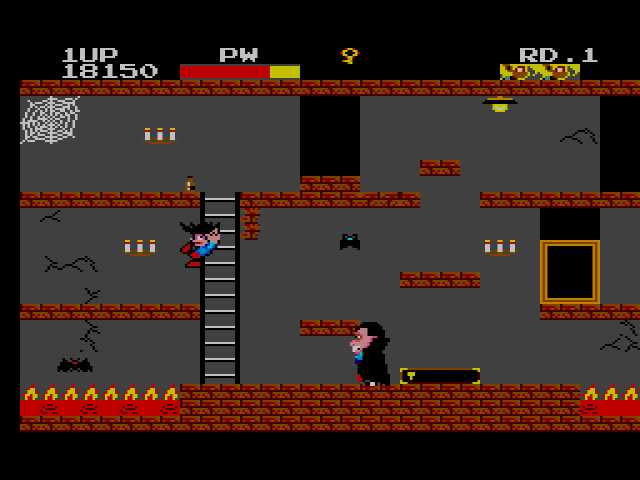 You play as Mick and you’re tasked with wandering through a three-story ghost house and overcoming the monsters within, particularly Count Dracula. Dracula has to be beaten five times per stage. Each time he’s beaten, he’ll drop a jewel. Gather all five jewels and a doorway will appear to take you to the next stage. In order to initiate a battle with Drac, however, you must acquire a key. Keys are randomly generated/dropped from one of the surrounding bats, ghouls, and fire-breathing meatballs. Sometimes you’ll get lucky and the first enemy you’ll hit will drop a key. Other times, you’ll have to punch at least a dozen creatures before they drop anything. Grimace from the Ronald McDonald Gang makes a guest (ghost?) appearance. Thing #1: almost every aspect of the ghost house will interact with you to try and cause you harm. For example, when you pass by any candelabra on the walls, the house spits a knife at you from off-screen. The knife will either hit you and cause damage or you can jump on it, put it in your pouch, and use the knife yourself for a limited time. This is especially good for fighting Dracula because your punch has a short range and your jump attack won’t work on him. Thing #2: like the disorienting, repeating levels in Teddy Boy Blues, each story of the Ghost House itself will repeat if you walk in the same direction long enough. Also, when you enter the black doorways, they will always spit you out at a random location, including otherwise enclosed areas that might have important items. This is great information for when you’re exasperated while looking for the last Dracula coffin. Getting flung backwards by bats is an all-too-common occurrence. Thing #3: there are so many damn enemies in this game, particularly bats, the vermin of the sky (or, in this case, the indoors). While you are able to punch them, jump on them, or stab them, I grew weary with having to wrestle with enemies every couple steps. Thankfully, you have a long life meter, but it’s less about the damage the bats cause and more about their endless numbers. Coupled with the off-screen projectiles, Ghost House can get downright infuriating at times. Battling Dracula is a crapshoot. If you know the tricks, he’ll go down easy. Otherwise, consider your blood drained. Once you unlock his coffin, he comes out and flies around wildly as a bat. If you’re lucky, you’ll be able to sneak a punch or a stab in when he dive-bombs you, but you’ll usually take a hit yourself too. If you’re near a ceiling light, however, jump into it and every enemy on screen will freeze, including Dracula. If the big D is in a position where you can easily hit him a few times, do so, and he’ll turn into dust. The ceiling light trick works exactly five times per round, and since there are five Dracula battles per round, the smart thing to do would be to save one trick per battle. Ghost House has a quirky charm that’s distinctly Sega, but it doesn’t go far enough. 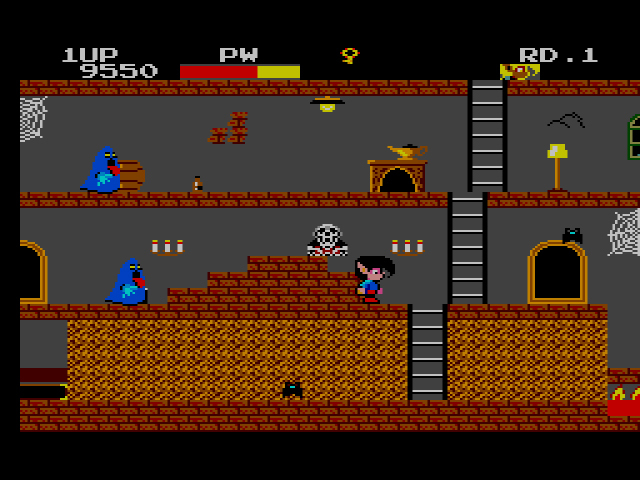 Three levels with slightly varied templates and the same basic “Kill Dracula again” objective for each stage feels slight, particularly for a Mark III title. The title Ghost House has unlimited possibilities too, both for monsters to battle and environments to explore. Why stop at Dracula when you could battle Frankenstein, the Wolfman or any one of Universal’s beloved monster backlog? Why limit yourself to a three story house when you could throw in a castle or a graveyard, if only to distinguish the stages from each other? Granted, Ghost House is a Sega Card game with only 32kb of limited space to work with. But limited space doesn’t have to mean limited ideas. Considering the promise Ghost House‘s premise contains, methinks Sega was just being lazy with this one. Next Article [UPDATE] Six Months Later: Where Do We Go From Here? Could you count this as one of the first survival horror games? It’s definitely a fight for survival game, sans the horror. That would probrably be Ataris Haunted House. I know the Master System’s case covers were bland but the European case for this is the laziest one yet. Wonder Boy’s goofy drawing stands out as being particularly bad to me.